Is your app available in different countries around the world? If so – pay attention! This week we dug into the benefits of localizing your app, the process, and what to pay attention to when translating your app. 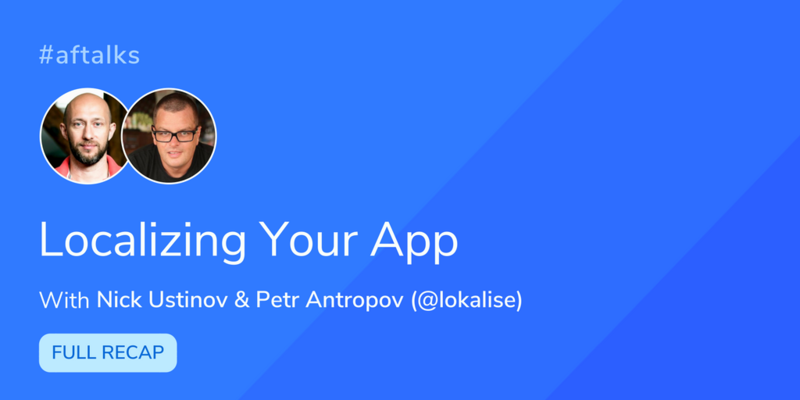 Our guests this week were Nick Ustinov, the Founder & CTO, and Petr Antropov, Business Development, at Lokalise. Localizing your app, game or website requires organization and access to translators. Lokalise handles both. What started as an internal translation management tool has grown into a platform that helps thousands of developers keep their localization files consistent while offering product managers and translators a quick and sleek translation tool. Q1: What are the obvious and less obvious benefits of localizing your app? A: Fact: 23 of the top 25 grossing iPhone apps in China have Chinese localization. Why bother? When your app is available in users’ native language, they open the app more often and stay longer. They are more willing to spend money and actually are spending more money. Moreover, they share your app much more. As a result, you will get more users and higher revenues. 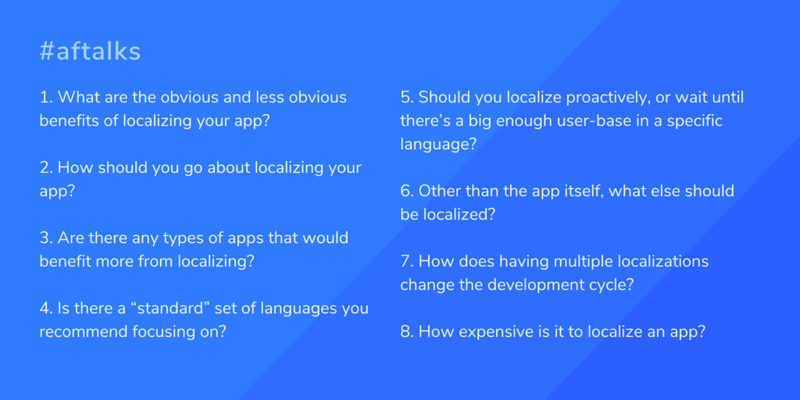 Q2: How should you go about localizing your app? a. Your app should be internationalized, i.e. be ready for more languages than one. b. To save time and money, use one of the web-based translation platforms available, where the product people, translators, and software developers can write copy, edit, translate and deploy to production. c. Choose whether to order translations from freelance translators or agencies or translation platforms, which is cheaper or recruit translators and translate in-house — usually more expensive. Should you have an international team, you can do translating your app internally for some time. Q3: Are there any types of apps that would benefit more from localizing? A: Any app will benefit. The easiest is to look at your current market, the demographics of your app. Where do your users come from, what is the interface language in their phones? If you’re expanding to new territories, you can be proactive and translate to new languages in advance of the entry. Lastly, there’re apps with app store descriptions in several languages and only one language in the app — an obvious go for localizing the app. Q4: Is there a “standard” set of languages you recommend focusing on? Is more better? Or, is it dependent on the app itself? A: There’s no standard set. Take retroactive (checking your current demographics) or proactive (expanding to new markets) approach to decide. Still, you can just choose the languages of most users, English, Chinese, Spanish, Japanese, Portuguese etc. Or the most profitable countries: USA, Japan, China, South Korea etc. Q5: Should you localize proactively, or wait until there’s a big enough user-base in a specific language? A: You can go either way or combine both, really. Obviously monetizing your current traffic is less risk comparing to grabbing other markets. Q6: Other than the app itself, what else should be localized (app description, screenshots, tutorials, etc.)? A: Everything. Any single language asset will benefit from localization. Your keywords will be stronger, your ads will be more effective. Fact: localized ad campaigns are 2x as successful. Q7: How does having multiple localizations change the development cycle? Does it slow it down? Do you have any tips to simplify that process? A: Multiple localizations should not put a burden on the development cycle. Many apps carry 40+ languages, e.g. our neighbor ask.fm. If you’re using 3rd party translation platform, integrate using their API / CLI tools and over-the-air iOS and Android SDK. Q8: How expensive is it to localize an app? A: Apps use lokalise.co for managing and hosting their own translations ($40/mo), 50% of them also order translations from us. In the latter case, a typical app is 1,000 words big, including the app store metadata and ads. It costs 5-15 cents per word, i.e. $50-150 to translate an app into 1 language, and takes less than 1 day. Translations into many languages are made simultaneously with no delay. Besides, apps integrate Lokalise iOS and Android SDK in order to update the texts in their apps over the air, without a new version, be it mistakes, marketing changes or adding translations. Tell us about your experience with localization in the comments section below. Huge thanks to Nick & Petr, and to all those that were part of today’s discussion! Join us for our weekly Twitter chat every Tuesday at 2pm ET (bring your friends!). See you all next week!